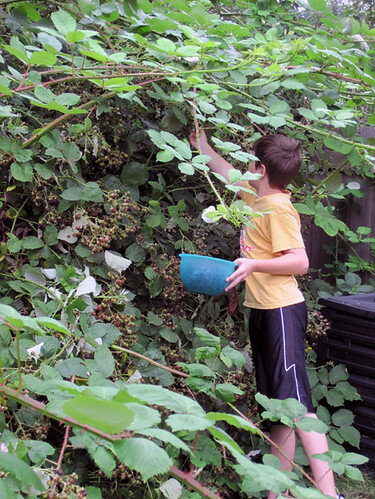 This is our first summer in Washington and we were so excited when we moved in and saw the Blackberry bushes in the backyard and as we started exploring, they are in the front yard too. Blackberries grow wild all over the island and you can find them everywhere but it is really handy to have them right here. So now that August is here we have a plethora of blackberries and have to decide what to do with them. My first thought is dessert. Sean’s is blackberry infused vodka. I have made both, but will share the dessert first. 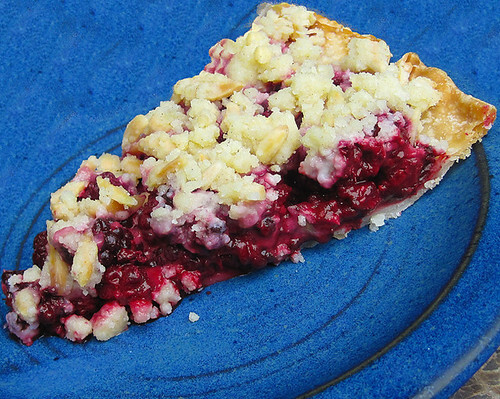 I dug around and found a few recipes and came up with a beautiful Blackberry Pie Crumble. I don’t really care for double crusted pies it just seems to be a bit too much crust for me so this was just the one for me. I loved the crumble I was glad it made plenty because I was having a hard time not eating it all before I put it on top of the filling! I used a frozen pie crust because they are sooooo simple and I think they taste fine! Place in a 9-inch pie dish and bake for 10 minutes. For the filling: In a large bowl, gently mix together the blackberries, sugar, flour, lime juice and ginger. Pour the mixture into the cooled pie shell. For the Crumble: In a bowl, mix together the flour, almonds, sugar and cardamom. Top the pie with the crumble and place in the oven and bake for 30 minutes, or until the crumb topping is golden brown. Boy, that looks good! I bet it didn’t last long!! How fun to have the berries right in your own yard!! Love the addition of ginger AND cardamom! I know do you believe!! That’s only because the weather allows it here in the great NW. No aircon bills!! This is a beautiful pie. What fun to be able to pick them from your own backyard! When I was growing up, my grandparents had a cabin about an hour north of Vancouver. Just down the road from the cabin was a field of blackberry bushes. What a treat it was to pick and eat them. 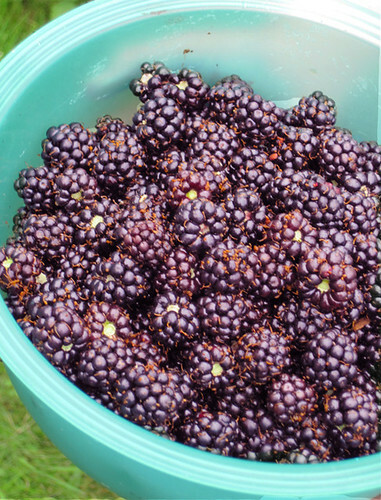 use to pick blackberries upstate ny every year boy does this bring back memories, love the post and the pie! I must say I envy you for having your own supply of blackberries 🙂 Your crumble looks gorgeous! I love blackberry pie and miss my bushes now that we’ve moved. Your pie looks delicious. Thanks for the recipe! My mouth is watering…looks delicious! Cardamom is my favorite addition to almost any fruit dessert. Thanks for a great post! Wow that looks amazing! My mouth was watering just reading this post! I used to have fresh blackberries in my back yard. Now I get them at the farmers market. This recipe sounds delish! Beautiful pie Wanda. Cardamom has become one of my favorite baking ingredients as of late. I don’t know why I just assumed it was only for savory dishes for so long. It’s fantastic in desserts like this. Gorgeous photos as well. Oh and how great is it to go pick your berries and then bring them home and cook? So lucky to have those bushes. I can buy local blackberries and normally I do a couple of times a summer. I do make a crumble, always delicious. I have also made scones. Thanks for the recipe. Like you we have Blackberry bushes in our garden. Each year most have gone to waste, but yesterday I saw your recipe for Blackberry crumble and decided to give it a go. Fantastic, just the thing with home-made vanilla ice-cream. Thanks! So we’ve picked about 35 pounds of blackberries to date and there are still more to be had, I just can’t resist free food. 20 pounds + in the freezer, the rest into jam (regular and w/chipotle), syrup – sooo good on vanilla ice cream, and blackberry infused vodka. HOLY COW! And Emma said Wanda was out planting blueberry bushes last week. That’s a LOT of treats, hmmMMMmmmm, do I see a jar of jam in my near future?